My Highly Caffeinated Thought: This book is packed with suspense, twists, turns, and an ending that I didn't see coming. Loved every single word. MY SISTER’S BONES is one of my favorite books of the year so far. This debut novel checks all the boxes for a completely addictive thriller. The author has created these beautifully flawed characters that pull you into a tale of secrets, lies, and pain. The psychological suspense is built by the careful unraveling of a complex web of memories from not only Kate, but her sister as well. This book is smart, fast-paced, and all consuming. I loved the way that each part brought us closer to the shocking ending, but also brought us a few steps back as well. The author gives us just enough to make us think that we know what is going to happen, but then takes it all way within paragraphs. To say that I loved this book would be an understatement. It is a must read for anyone who loves mysteries and suspense novel. Yet, it is also a book that goes beyond just the suspense and taps into honest human emotion. Loved this book! I cannot wait to see what is next from Ellwood. Reviewer Disclaimer: I received a free copy of this book from the publisher and TLC Book Tours in exchange for my honest review. 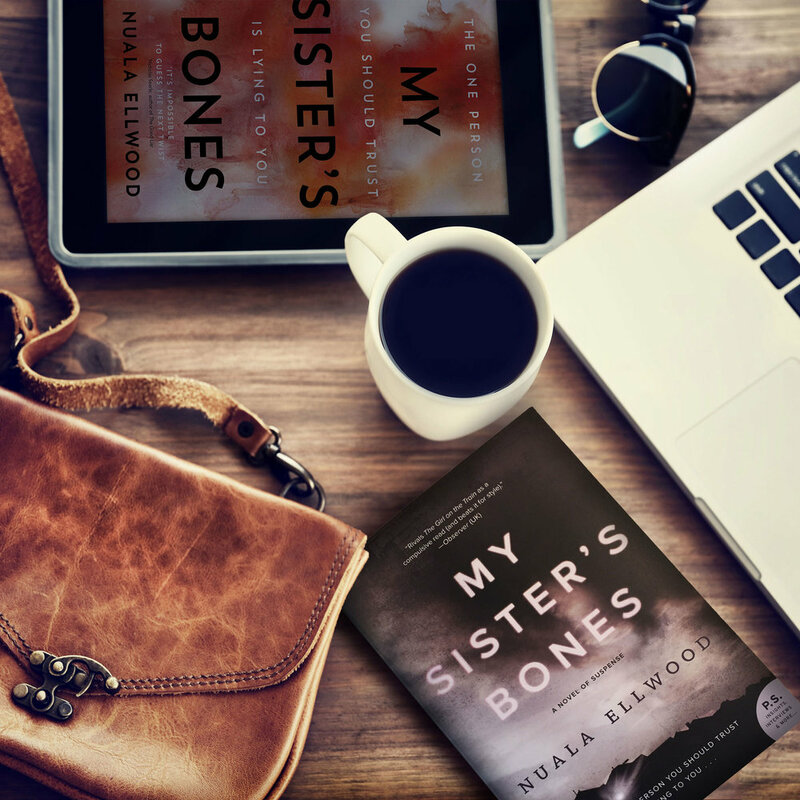 My Sister’s Bones tells the story of Kate Rafter, a troubled war reporter who has just been through a harrowing ordeal in Syria. When her mother dies Kate returns to her childhood home, a place her estranged sister has never left, and becomes convinced there is a crime being committed in the house next door. As Kate struggles with the horrors of her past we are led to question the validity of her claims and ask if what we are seeing is but a strange trick of the eye. To find out more, visit her website and Twitter @nualawrites.